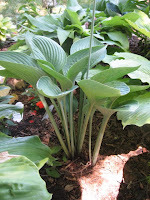 For those of you out there who think that all hostas look alike, I introduce you to the hosta 'Nigrescens'. It is a beautiful color, with upright stems that end in what I like to call shovel shaped leaves. 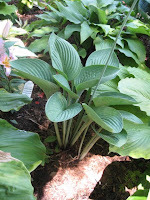 It originates from Japan where it is actually referred to as a black hosta. I would like to say it's blue in color, but I know others will correct me and say that it is really gray/green in color. Whatever the color, it's a beautiful hosta. Very nice! I like the way it grows up tall looking. Very pretty! Very nice. I love the upright hostas.